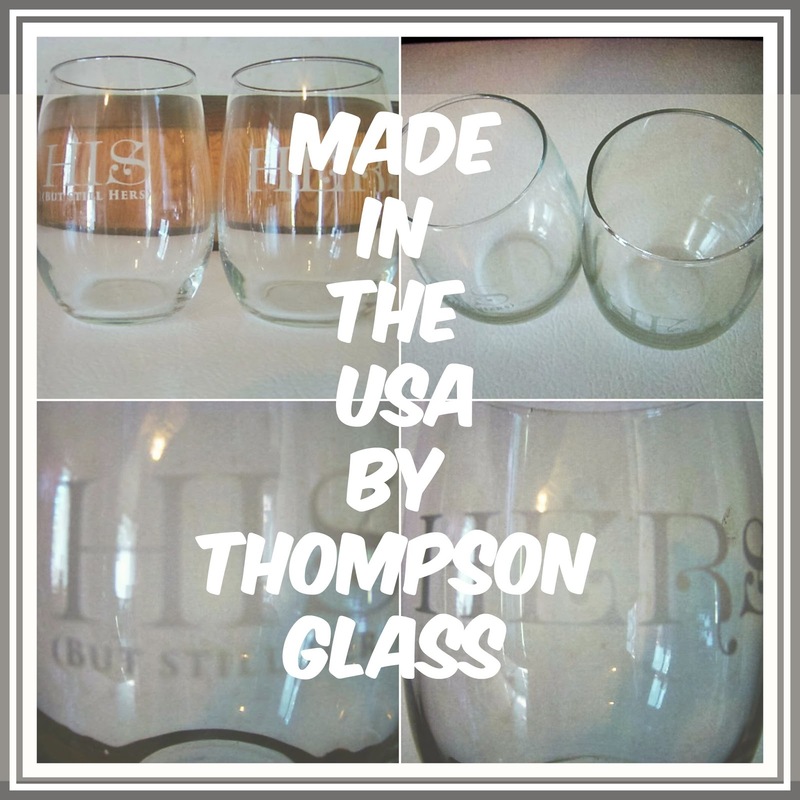 I am pleased with the elegant pair of wine glass made by Thompson Glass Products. I love how the glasses can fit into a hand. My boyfriend hands are two times larger than mine. Neither one of us has an issues holding, grasping or picking up the glasses. Another thing I like about these glasses, the glasses are made in the USA. I get excited when I come across products made in my country. As many of our businesses have moved over seas. 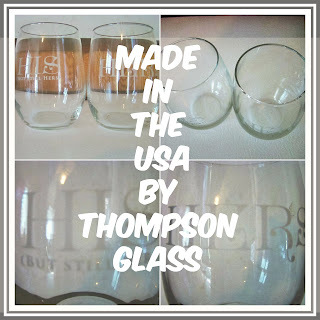 If you want to support an American business and buy beautiful wine glasses. You should check out this company and see what else they produce. The glasses can hold up to 15 ounces of wine, liquor or other beverage of your choice. One of the glasses has the words hers, the other one says his but still hers. This is a running joke between my boyfriend and me. Of course I had to order a pair. As they make a beautiful addition to my cupboard. I like how the glasses curve in near the top. This helps prevent spillage if a glass gets bumped. I like to store mine in the freezer door to chill before pouring in a beverage. I recived this product for free or a deep discount. In exchange for a honest and unbiased review. Photos taken by and © belongs to Sandy KS aka rusty2rusty. I too use much ice in my drinks. I like my drinks to be ice cold. I tend to be really picky about glasses, since I'm clumsy (due to proprioceptive sensory issues). I never thought about the curve at the top being so helpful like that. Thanks for sharing that. I am clumsy from time to time and will spill things. As I have issues with my wrist. The way the top curves in does help me from preventing small spills. I tend to choose curved glasses for this reason. These look super nice and cute. I also love glasses that are curved near the top. I like it for the style but also to help not spill things. Glad you liked them! The glasses look great, a good gift for wine drinkers!